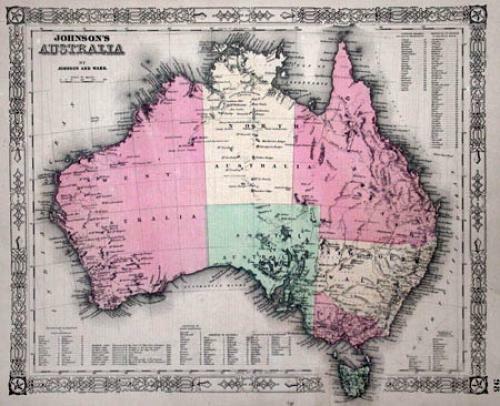 This map came from the rare 1860s edition of Johnson's Atlas and is a steel plate engraving. Johnson here reveals a partially explored continent. Rivers disappear with notations like 'creek is lost' and sandy deserts are carefully labeled. Of note are the various railroads, both active and proposed, that run across the state. Interesting features include carefully marked military campaigns and explorer's routes, numerous indigenous tribes, rapids, and mineral deposits. Political boundaries as well as major rivers, territories, and counties are carefully labeled. Included are mineral deposits, major roads, trade routes, and proposed railroads. Further, all notable mountains, swamps, passes, mines, and even important trading posts are labeled.